LONDON, UK – 21st March 2019 — /BackupReview.info/ — Storage Made Easy® (SME) today announced its new Compliance Healthcheck Report to help companies comply with regimes such as GDPR, HIPAA, FERPA, GBLA or the Californian Privacy Act. The Enterprise File Fabric is a multi-cloud content solution that provides strong compliance and control features. Many companies today have document repositories that extend beyond their company borders into the Cloud. Keeping track of where sensitive data is stored and whether appropriate policies have been put in place, many of which are now required from a regulatory standpoint, is becoming increasingly difficult. The Compliance Healthcheck provides a quick easy way for companies to understand what policies are in place with recommendations as to whether any others should be considered. The File Fabric indexes and analyses information in real-time providing sensitive content alerts with automated actions that can be pre-configured. It is constantly auditing all file events that occur across a companies file estate, whether on-cloud or on-premises. Storage Made Easy provides a multi-cloud data management and data protection product called the Enterprise File Fabric™ that unifies on-premises and on-cloud company storage assets in addition to standalone products that bridge desktop and cloud, such as operating system native cloud drives and cloud explorer applications. The File Fabric provides cloud-like economics across a company’s storage portfolio, unlocking the benefits and cost-efficiency of its data assets whilst providing strict controls and governance for legislative compliance and security concerns such as ransomware attacks. Existing site-based storage infrastructures can be transformed into an on-premises private cloud, delivering a storage-as-a- service model to the company. Local storage can be connected to public clouds, expertly managed by the File Fabric as a unified hybrid cloud storage platform. 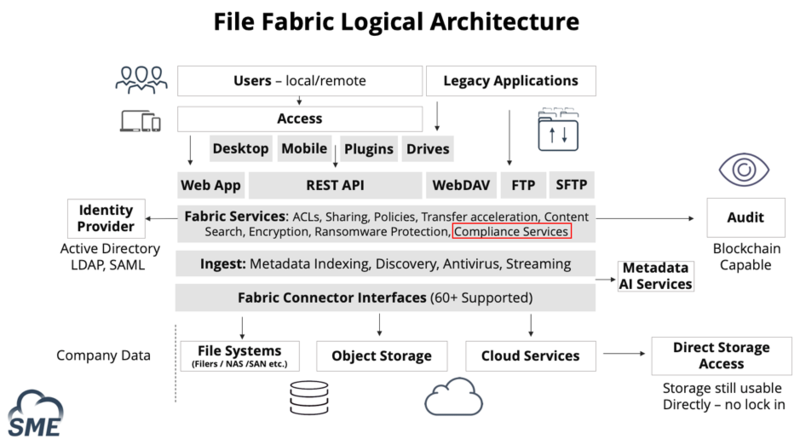 The File Fabric solution offers a “blanket” that companies can privately apply to wrap around all their data: on-premises, within a public cloud, or on a third party software vendors’ cloud (SharePoint or Salesforce for example). Customers can use the File Fabric for security, encryption and control with a focus on compliance regimes such as GDPR, HIPAA, FERPA and GBLA. Customers include one of the world’s largest social media companies, and also one of the largest global retailers, in addition to global internet service providers, universities and international government and governmental bodies. The company is backed by one of the largest alternative asset managers in addition to entrepreneurs in the London market insurance industry, who have previously successfully sold their company to a listed peer. Storage Made Easy is the trading name of Vehera LTD. Follow us on Twitter @SMEStorage and @storagemadeeasy and visit us at www.StorageMadeEasy.com to learn more.